BookTrust, as part of their Time to Read campaign argues the importance of visual literacy for children’s development. The UK’s largest children’s reading charity, alongside developmental psychologist Emma Kenny argues that understanding imagery and identifying visual clues in illustrated books helps young children to make sense of wider topics as they get older. 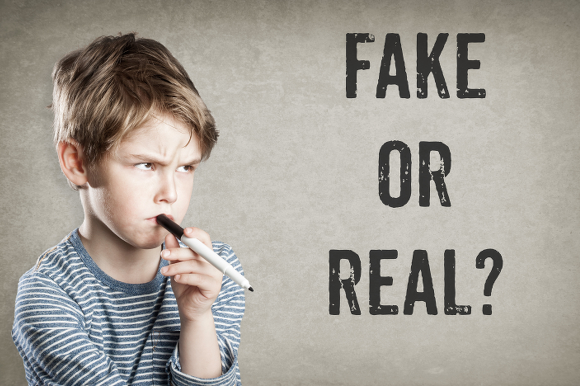 In a world where advertising becomes ever more pervasive and fake news continues to infiltrate news sources at an alarming rate, children can often struggle to tell the difference between what’s real and fake. Having the ability to understand context and symbolism and decode information is crucial for young people if we want them to become more active learners and help arm them against the barrage of fake news. BookTrust believes that reading and sharing stories is vital for helping children think for themselves and encourage wider discussions. Illustrated books help children to develop free association, to understand inference and to create their own narratives rather than accepting things at face value. This September, as part of its annual Time to Read Campaign, BookTrust, Emma Kenny and leading children’s illustrators including Chris Riddell, Sarah McIntyre of the Pictures Mean Business campaign and Waterstones Children’s Laureate, Lauren Child, are asking families to recognise the importance of illustrated books and to take time to explore reading and sharing stories together to help children to understand the world around them, enable them to figure out fact from fiction and allow them to become more independent thinkers. BookTrust, the UK’s largest children’s reading charity is giving away over 700,000 copies of Little Monkey by author and illustrator Marta Altés to every reception aged child in England. Little Monkey is a great book to get kids excited about reading. It’s filled with beautiful illustrations and lots of colourful pictures that give young readers hints to help encourage them to think outside the box to understand the unwritten dangers in the story. A pupil from King Edward’s Witley has stepped in to offer his artistic skills to this year’s Haslemere Hares, an innovative community arts project designed to promote the town through the powerful medium of art. Harvey King, 14, grandson of Haslemere Hares organiser Brian Howard, took on the challenge of depicting the 12 labours of Hercules on this hare, one of 100 fibreglass hares now on display around the town of Haslemere. Following the display period, the hares will be auctioned to raise funds for charities and HAREcules’ sale will benefit Classics for All (CFA), a small charity that works to promote and support the teaching of the Classics in as many schools as possible. CFA was chosen by Harvey and his grandfather as the beneficiary of the sale. Harvey is a pupil at King Edward’s Witley where as well as studying Latin as a curricular subject, is currently the schools only Greekist as an extra-curricular activity, under the tutelage of the school Chaplain, Rev. David Standen. Haslemere Hares follows last year’s successful Haslemere Hogs initiative, which raised £35,000 for local good causes; this year’s ‘Hares’ project, which involves local artists and schools, hopes to raise even more money. King Edward’s pupils have already been involved in the project. 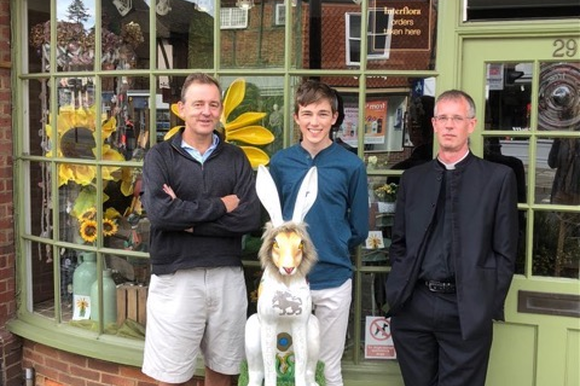 As a sponsor of the Haslemere Hares fund-raiser, pupils were asked to decorate their very own fibre-glass hare under the guidance of Graduate Assistant Miss Annie Edwards. Taking advantage of the School’s extensive arts they created Luminous Lepus, a light emanating fibre-optic hare. A Surrey-based charity has won an award at this year’s BMA Patient Information Awards. 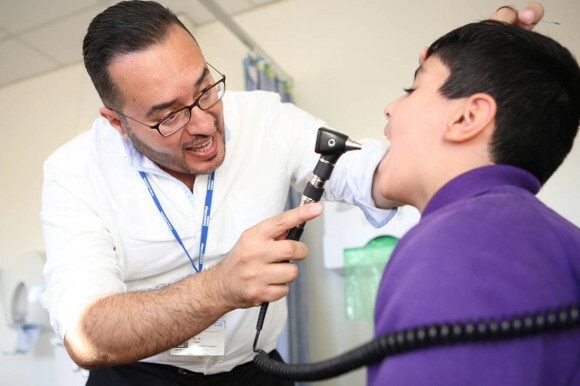 The Children’s Trust in Tadsworth was chosen as the winner of the User Engagement prize for their short film ‘From me, to you’ at the awards hosted by the British Medical Association yesterday (Tuesday 25 September) at BMA House in Tavistock Square, London. Often children and their families who stay at The Children's Trust for neurorehabilitation have been through a traumatic and life-changing experience. They’ve spent a long period in hospital and life can be very frightening. Their winning film provides an honest account of what to expect when moving to The Children's Trust, from families that have been through a similar experience themselves. Three families were involved in the making of the film, and their interviews are unscripted – they’re talking openly and honestly about their experiences. The Children’s Trust also were named the runner up in the “Young Adult” category for their resource “Me and my brain” which helps teenagers and young people manage the many, often hidden, effects of mild to moderate Acquired Brain Injury. “The BMA are privileged to be able to host the Patient Information Awards 2018 with this year’s recipients showcasing the very highest standard of innovative, well-designed and carefully balanced patient information. Arts and crafts enthusiasts or those who would just like to try something new, now have the chance with 10 free workshops held across the borough as part of the sixth annual Big Draw in October. The workshops, organised by the Council’s Arts Development Team, run from 7 – 28 October and take the national theme of ‘Play’. They are open to all and specially designed to let people explore new and creative ideas through arts and craft either individually or as a group or family. There are also two outdoor sessions and one over 18’s adult class. 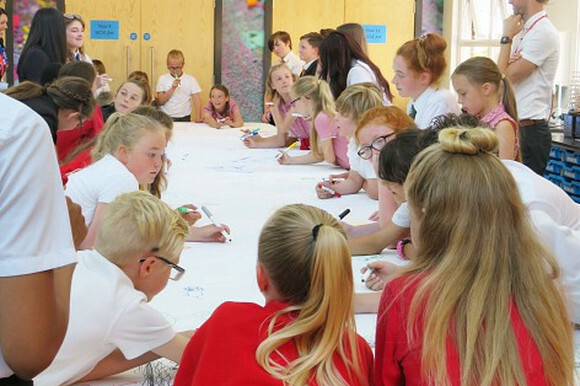 Cllr Nikki Nelson Smith, Lead Councillor of Skills, Arts and Tourism says: “The Big Draw is a fantastic opportunity for people of all ages to express their creativity. With the festival taking place in 25 countries throughout the world, it’s great to be part of such a successful international initiative providing the chance for communities of all ages and abilities come together and celebrate creativity." Artist Becci Kenning from Art in Transit says: “I am delighted to be invited back to deliver a workshop for Guildford’s Big Draw, its national reach in promoting the skill and use of drawing is vital; encouraging everyone to experiment and just ‘have a go’. My workshop will be all about big and playful artwork." "I really enjoyed creating things with my granddaughter." "Gives people a chance to try new things and release their imagination." "Brilliant! Love the way everyone was included and involved." "Nice to see it's for adults as well as children." "Great fun! Love the opportunity to try something I've never done before." "Looking forward to the next one!" Please provide your name, email address and use the reference 'Big Draw Mailing'. You can also pick up a copy of the Big Draw leaflet from Guildford Tourist Information Office, 155 High Street, Guildford, GU1 3AJ (open Monday to Saturday, 9.30am to 5pm). Watch out! 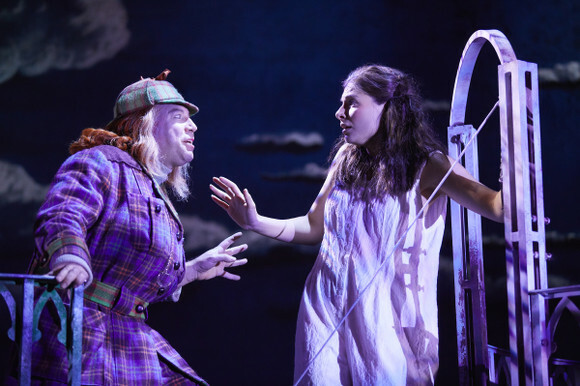 David Walliams' Awful Auntie is round and about in Guildford soon! Watch out! David Walliams’ Awful Auntie is coming to Guildford’s G Live, Wednesday 17 - Saturday 20 October. Citizens of Guildford are advised to watch out for a very large owl as well as the most awful Auntie in history who will be up against a brave little girl and her ghostly friend. This funny and exciting new show is from Birmingham Stage Company, the award-winning producers who brought David Walliams’ Gangsta Granny to this theatre. Awful Auntie tells the story of Stella, who when she sets off to visit London with her parents had no idea her life was in danger. Waking up from a coma three months later, only her Aunt Alberta can tell Stella what has happened. But not everything Aunt Alberta tells her turns out to be true and Stella quickly discovers she’s in for the fight of her life against her very own awful Auntie!